Simon & Schuster Books for Young Readers, 9781416986898, 40pp. 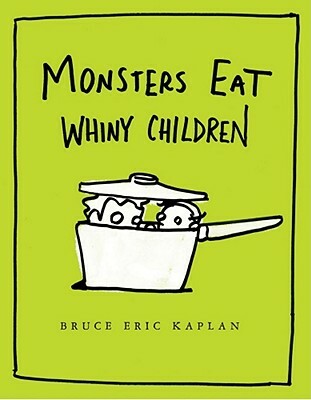 This cautionary tale about whiny children being eaten by monsters is upended when the monsters cannot decide how best to prepare their meal. A whiny child salad doesn't work because there's paprika in the dressing. A whiny child cake won't do because the flour spills all over the floor. Whiny child burgers are out of the question because the grill is too hard to light. When the persnickety monsters finally decide that whiny child cucumber sandwiches are the perfect solution, their whiny children have escaped. At least the children have learned their lesson...for now.